For 58-year-old Jane Lerner of Rockaway, N.Y., every day is a struggle to maintain her weight. “I think I’ve always been concerned with my weight and my body image,” she said. “When I go to get dressed on the weekend and I can’t fit into my clothing it immediately sets me up for another diet. A yo-yo dieter since her teen years, Lerner ‘s weight has fluctuated between 140 and 208 pounds. Constantly striving to fit into her ideal “thin mold,” Lerner admits to spending roughly $10,000 on diet products. Lerner has tried many different varieties of diet pills in her quest to get thin, and she is not alone. Each year Americans spend more than $18 billion on the roughly 29,000 varieties of appetite suppressants for sale across the country. “It seems like a diet pill would be like the magic bullet or a miracle cure. It’s not, because there is no quick fix,” said Bonnie Taub-Dix, a registered dietitian in private practice in New York City and a spokeswoman for the American Dietetic Association. “We are obsessed with our weight and the need to lose weight, and yet we follow means of dieting that just takes care of the symptom and not the problem, which is faulty eating habits,” she added. Despite well-publicized risks involved in taking diet pills, consumers continue to buy in mass quantities. The latest fad in the appetite suppressant boom is Emagrece, known more simply as the Brazilian diet pill, sold mostly on the Internet. “Most of the diet pills that are touted in infomercials are, at best, ineffective and, at worst, dangerous to your health,” said “Good Morning America” medical contributor Dr. David Katz. Many diet pills have an amphetamine-like compound, he added, which can be dangerous to your heart. Fifteen pounds from her target weight, Lerner says she has given up the idea of quick fix for a healthier solution. “I think it will be an ongoing thing, but yes, I am happy with how I feel and the way I look,” she said. Lerner and other dieters will be pleased to learn that some great foods have natural, built-in appetite suppressants. Here are some foods to work into your diet, said Katz. 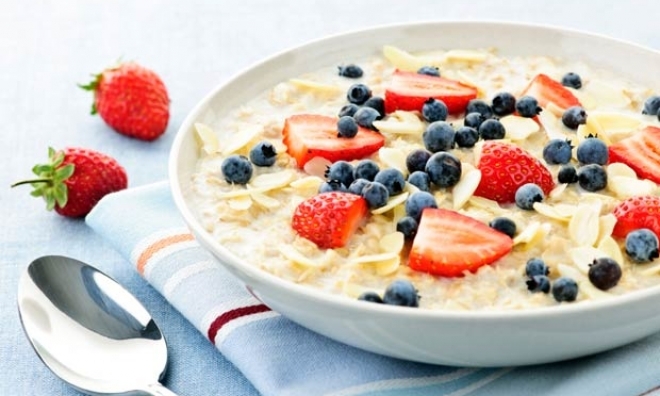 Oatmeal: A concentrated source of soluble fiber, oatmeal seems to contribute to a lasting sense of fullness because it stays in the intestines for a while. Also, it slows the nutrients going into your bloodstream. Lentils: They have the same effect as oatmeal. Try tossing lentils into your salad or eat them as a side dish to a meal. Apples or soup: These foods both take up a lot of space because they have so much water, but they have relatively few calories. An apple is a much bulkier food than highly processed food. Coffee: If you are healthy, you can drink up to four cups of coffee a day. The caffeine acts as an appetite suppressant. Some people get insomnia from caffeine, so have your last cup by 4 p.m.
Salmon steak: This is a good example of a healthy protein source. Calorie for calorie, protein is more filling than fat and carbs.